Twister ensures that offshore gas dehydration projects remain profitable throughout the operating cycle. With the minimum amount of gas processing taking place offshore, Twister’s proprietary expansion cooling dehydration solutions guarantee the safest means of dehydrating gas while significantly improving project costs. 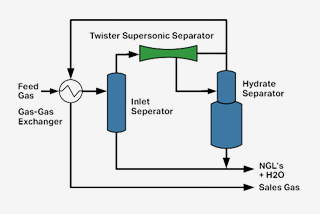 Ideal Twister solutions for offshore sweet gas dehydration are the Twister Supersonic Separator and Twister Hydrate Separator, both providing a safer, simpler and more financially viable alternative to fully manned glycol-based production platforms or wet gas evacuation. Specific features and benefits include an integrated wellhead production platform; process features including sea water coolers, a GGHEX (Gas/Gas Heat Exchanger), an inlet separator; a closed system with no glycol and minimum intervention; minimum inventory and minimum flaring; the least possible maintenance and maximum uptime; dehydration to <5 lbs/MMscf; weight savings of between 30 and 45% compared to the next best alternatives; and CAPEX savings of between 30 and 40%. Plateau pressure: Export pressure is 30 bar. For more than ten years, a Twister designed offshore dehydration system containing Twister’s proprietary Supersonic Separator and Hydrate Separators has been safely dehydrating 600 MMSCFD of natural gas. A safer, simpler and more financially viable alternative.